Description - From the creators of the hit Story Pirates Podcast comes an album full of songs for kids that parents will love, too! Nothing Is Impossible features twelve infectious songs, written and performed by the Story Pirates, based entirely on stories written by KIDS! To learn more about the us, visit storypirates.com! KIDS FIRST!® Adult Jurors say - The Story Pirates have created a lovely 12 song album based on original stories written by children ages 4 to 11. The imagination is brilliant throughout this project and the performances are impeccable. Each song is based on a different child's original story so each structure is unique to that particular content. You know you're in for a ride when the opening song is "Fart Out Loud Day," written by two sisters from Colorado. I'm sorry, but "Pass Gas Out Loud Day" just doesn't have the same je ne sais quoi - excuse my French. "All Eight Unicorns" are pretentious valley girls and reminded me of the Kardashians - silly unicorns! These are well produced arrangements and performances that are absolutely creatively stimulating for young minds. They are smart songs with a child's sensibility where imagination rules the day and written stories can blossom into something very special. The performances and production are first-rate across the board! Sharing observations and fun, silly ideas with peers can build positive social interaction. I would hope this concept would encourage a child to write down their own stories and observations. This would be a fun activity for the classroom. The hits keep coming and the smiles are plenty, so find your way to this gleaming pot of gold because Nothing Is Impossible! I give this 5 out of 5 stars and recommend it to ages 5 to 12. It is well produced, entertaining and fun. KIDS FIRST!® Kid Jurors say - Nothing is Impossible is a collection of songs that are impossible to get out of your head (in the best way possible)! These tunes are funny, addicting and creative. Kids and parents alike will love this music. Even as a teenager, I found this album really funny and musically impressive. I really enjoyed listening to each song and felt that I was listening to music that I could show my kids in years to come. 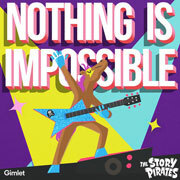 Nothing is Impossible features songs written and sung by the creators of the hit Story Pirates Podcast. It's based entirely on stories written by young children. The influences for these stories include six-year-old Leah from Maryland's story about being in the car (hence the title "In the Car"), a comic made by eleven-year-old Peer from California ("The Guy") and ten-year-old Alex from New York's story about a talking carrot ("Fred the Carrot"). One story that really caught my eye was four-year-old Ethan's from New Jersey. Ethan has heterotaxy, so he has a special heart and battery. He said the reason behind writing his story was that he would "love to run and catch a seagull, but I can't even jump that high so I wrote a story about it." I really want to commend Story Pirates for choosing Ethan's story and allowing him to express himself. It is really heartwarming to listen to that song and read Ethan's artist statement. Nothing is Impossible is really an awesome album. Kids will laugh hysterically at songs such as "Fart Out Loud Day" and "Fred the Carrot." Even I had to stop myself from chuckling. Some of these song lyrics are really creative, as are the concepts. It's hard to believe that young kids came up with these ideas. The songs promote self-love and positive messages for young kids, such as believing in yourself and being confident and proud. The concept of this collection is an original one. I've never heard of anyone basing songs off of kids' ideas. Kids can be smarter than grown-ups sometimes, so it is really interesting to see all of these cool concepts played out in song form. I recommend Nothing is Impossible for kids ages 2 to 10 and give it 5 out of 5 stars, because of its creativity and humor. This CD is a fun and entertaining way for young children to enjoy music and life. Thanks to its positivity, it may also boost their spirits and confidence. I really enjoyed this CD and I think younger kids will enjoy it even more. KIDS FIRST!® Kid Jurors say - Hey kids! Are you ready to learn STEM in a fun and educational way? This CD will have you grooving to the beat, making your head bop and your fingers snap away to higher learning. This collection includes two CDs and one DVD for your enjoyment. It also includes five karaoke tracks to encourage kids to sing along! I like everything about this collection, because every song has a lesson. Some children learn best through music. They stick in your head and get you singing along. It makes it easier to remember how science, technology, engineering and math works and how they affect our daily lives. I think that using songs that kids will listen to makes learning more lively for children. I felt as if I was a part of creating this CD. It is definitely is my kind of feel good music. Children's music artist Dan Crow and his partners at KidzMusic Records have collaborated with various children's performing artists to make learning about the STEM subjects more fun, through the art of music. This collection of CDs will draw a large audience of children. Dan Crow captures your attention as well as your parent's attention. On this CD you get music and learning, all to a fun beat. My favorite song has to be "Technology," on the Dan Crow concoctions CD. Technology goes as far back as the 1860s. Everyday technology is improving and innovating all the time and we try to keep up with it. Children today use technology a lot more in schools than they use textbooks. We use technology on a daily basis - our phones, TVs, cars, laptops and iPads, just to name a few. Technology never goes out of style. It changes constantly and only gets better and easier to use. I am pretty sure that you and your child will enjoy listening to this collection. Not only are the tunes catchy, but the lyrics are educational. This is a very fun way to further your knowledge on STEM subjects. I give this collection 5 out of 5 five stars and highly recommend it for ages 5 to 8. These two CDs and one DVD are affordable and available in stores and online now. Buy it for a friend who can use a good hip lesson. Reviewed by Sev'n F.
Description - Josh Lovelace, Knoxville, Tennessee native and member of the Grammy Nominated rock band NEEDTOBREATHE, has been making music his entire life. As a young kid, he would sing songs and put on shows for his family and friends, pretending to be the world's next big superstar. Now, 33 with two kids of his own, he is reliving the spirit of those early years with a collection of children's music the whole family can enjoy. This CD features 15 original songs, written from Josh's experiences as a father. Produced and recorded in his East Tennessee home, the record includes guest appearances by Ben Rector, Ellie Holcomb, Spirit Family Reunion and legendary children's recording artists Sharon & Bram. There is something for every member of the family to enjoy! 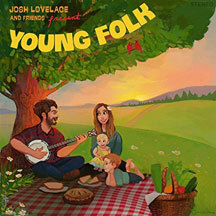 KIDS FIRST!® Adult Jurors say - Josh Lovelace's Young Folk album is sweet candy for the ears and soul. It's like being wrapped in a warm blanket, staring with wonder at the night skies with someone you love. Love is the overriding theme in this wholesome family collection that talks directly to and not down to inquisitive little ones, with just the right touch of zany added to the mix. Lovelace and Friends' vocals are smooth and inviting as a summer day. Fine production and songwriting round out a lovely, gentle listening experience. It is very accessible for children and adults alike - striking just the right balance. The flow of the album is perfect with each song a nice surprise. Lovelace draws from his family observations as he treasures every moment through his art. Love of family and each other permeate the collection along with caring and sharing life experiences. The songs are perfectly constructed with the intended audience in mind and include a few gems for adults. I can't say enough good things about it. I love the vocals and instrument choices. I would hope that the listener would model awareness of the moments and observations of the world around us. I definitely give this 5 out of 5 stars and recommend it to ages 3 to 8. Reviewed by John Wood, KIDS FIRST! Music Specialist. KIDS FIRST!® Kid Jurors say - Josh Lovelace and Friends Present: Young Folk is an album for the whole family with a nice, mellow atmosphere throughout including a few silly, fun songs. The collection is geared towards children by Josh Lovelace of the band NEEDTOBREATHE, who has been nominated for a Grammy. My favorite song on this album is You're My Very Best Friend because it is very sweet with good usage of backup vocals and it describes friendship quite well. It also tells me this is going to be different from other kids' albums with a much more sophisticated feeling to it. Where this album really succeeds is in its broad appeal. There are one or two louder, repetitive tracks on the album you might find on your typical children's CD, but there are also more quiet, reflective pieces that parents will also enjoy. This is why I give this CD and age recommendation 4 to 15 and rate it 4 out of 5 stars. I think I might go back and listen to this one again. I recommend you listen to this album for its fun, yet sophisticated atmosphere. Description - Strikingly crafted pop songs for kids, with stick-in-your-head lyrics and catchy melodies - plus a memorable cast of characters that bring kids into Andy's world, taking them on a musical adventure. The camp every kid will want to go to. KIDS FIRST!® Adult Jurors say - Lets go to Camp Andyland or camp in general or stay at home and listen to the CD! This CD is well produced and entertaining. If your busy schedule does not allow you to take your valuable time and refresh and renew at a Camp near you, then sit back, relax and listen to the infectiously fun Camp Andyland - a world inhabited by zany dinosaurs, not-so-scary pirates and a host of other silly sausages! The songs are engaging, delightful adventures that will tickle your ear lobes - and we all need that - so make a date to have some fun and sing-a-long with your new found friends at Camp Andyland! The character voices are quite engaging as are the different musical styles and fun kid-friendly topics. I predict lots of fun and participation from young audiences as they experience the quirky adventures and music. This exemplifies good songwriting skills, terrific use of tempo and instrumentation and very experienced kid-friendly content. Explore and learn about the many wondrous things in this big wide world! Andy respectfully connects to the kids, because he still retains the joys of the child within. He has a handle on what kids like and respond to and doesn't talk down them, but leans in to their level. This is a professional recording all around. Andy does most of the heavy lifting on vocals, instruments and character voices and the recording quality is well done. I give this 4 out of 5 stars and recommend it for ages 5 to 8. Reviewed by John W., KIDS FIRST! Adult Music Juror. KIDS FIRST!® Kid Jurors say - Are you ready for camp? Sit back, relax and listen to the upbeat, feel-good music to cheer you up! Let's take a trip with Camp Andy, the camp every kid will want to go, with true joy from beginning to end. I perfectly love tuning in, singing and grooving to the songs. This collection of appealing, remarkable fun, lovely adventures is produced, arranged and engineered by Andy Z. 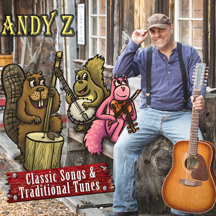 This CD is filled with strikingly crafted pop songs for kids, stick-in-your-head lyrics and catchy melodies - plus, a memorable cast of characters that bring kids into Andy Z's world. This infectious collection of songs contains many from the popular AndyLand series such as "Welcome to AndyLand," "Return to AndyLand" and "Summer in AndyLand." This collection includes 16 songs, each with a catchy melody and memorable lyrics. I must say, it's an astonishing set of songs. Each song puts you into the camp vibe. Plus, the memorable cast of characters brings kids into Andy Z's world. You can see Andy's creativity and imagination in each song. This whole CD definitely kept me engaged from the beginning to the end. My favorite song is definitely "I Went to a Party with Dinosaurs," because the lyric are outstandingly funny. This song certainly gave me a laugh-out-loud moment. The rhymes have a way of making you giggle. For example, here's one of my favorites lyrics: "I went on over to say 'hello' and he almost bit off my nose." That rhyme shows why it made me laugh like crazy. The song brings has a professional vibe with its high pitch instruments and great vocals. Who is Andy Z? 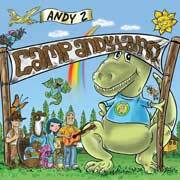 Andy is the creator of Camp AndyLand and all its humorous songs. He is an multiple award-winning children's performer, singer, songwriter and educator who combines music, movement, storytelling and character puppets to create a experience that capture children's attention. I believe the whole family will enjoy this musical collection and kids will enjoy the funny, kid-friendly, exciting, intriguing set of songs. I give this 5 out of 5 stars and recommend it for ages 5 to 8. This CD is now available online and at discriminating music stores. Description - Parlez-vous cha, cha, cha? From samba and merengue to rumba and reggae, this wildly fun collection of songs with Latin and Caribbean rhythms adds an exciting twist to learning French that makes learning French as easy as un, deux, trois. 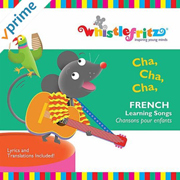 KIDS FIRST!® Kid Jurors say - Whistlefritz: Cha Cha Cha is an upbeat album for the whole family that helps kids learn French in a new and fun way. 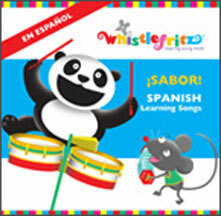 Each song on Whistlefritz: Cha Cha Cha teaches a different aspect of speaking the French language. Songs range from being about the seasons to the days of the week and even certain jobs. This CD is great at teaching vocabulary. The songs are sufficiently repetitive in a way that will educate those new to French, but won't annoy those already familiar with the vocabulary being taught. Even if you don't wish to learn French, the songs are peppy and catchy. A lot of different instruments are used and every song has a different feel and vibe. I recommend it for ages 3 to 18. As long as your child or you are ready to learn some French, you should enjoy this CD. I would recommend this as a segue even into beginning level adults learning French. I give it 4.5 out of 5 stars. It is a nice review of some things in French for me, as someone who already knows some, and both beginners and experienced speakers are certain to get something out of this CD. Cha, Cha, Cha: French Learning Songs is a helpful, educational, kid-friendly collection of songs that encourage learning the language of French through the art of song. French is a beautiful language that is great to know. The fun songs on this track really add something special to the experience of learning. I had an awesome time listening to these songs and following along with the booklet provided. The woman who sings has a lovely voice, which is complemented by the upbeat rhythms of the music. This CD is full of catchy tunes that are easy to learn and fun for kids to sing along to. The music is energetic, fun and an absolute blast. It is child friendly and, at the same time very educational. I have no doubt that kids who genuinely want to learn French will enjoy this immensely. I give this CD 5 out of 5 and commend it for ages 2 to 8. I loved this CD and think that it is a unique and helpful way to assist young learners who want to broaden their horizons and learn a new language. It's available now wherever CDs are sold and online at Whistlefritz so, look for it. I really enjoyed listening to this CD. It is entertaining music that uses catchy and recognizable songs to teach French! It makes fun background music for little kids and they can do anything they want while listening to the music. By hearing the music at young age, they will learn French by immersion. It's like singing to kids and learning English without thinking about, just the way we learn English. It comes with the English words to the songs as well, so you can read those while listening if you like. I have to admit that it was a bit difficult for me to understand everything, because I don't know French. But kids under the age of five will probably get the hang of it quicker and will be singing the tunes without knowing they are singing in French. If you're older, you may like it the CD because the tunes are catchy and fun to listen to. I recommend this for ages 2 to 5 and give it 5 out of 5 stars. It is available now wherever CDs are sold and online at Whistlefritz. Everyone get ready to move and grove to this terrific new CD! I adore the catchy beat of the music and how I found myself singing in French right away. Cha, Cha, Cha: French Learning Songs is musically creative and makes you want to dance and sing. Even if you don't know the French words, you soon will. One thing that I really love about this is that it teaches you French in a wondrous way that kids, young and old will enjoy. Everyone likes music, so what better way to learn French than through song. The songs are about the mouths of the year, different types of fruits, numbers and BINGO - the song that everyone loves. Since the songs are in French, the CD comes with a booklet that translates the lyrics into English, so you will understand every word. I enjoyed this factor because I now know how to say things like kiwi and October in French as well as English. I recommend this for ages 4 to 13 and give it 5 out of 5 stars. Description - When a shiny spaceship lands in Emilia's backyard, she meets URR from planet Goopda who has traveled to Earth to promote universal peace. The two learn about working together and making the world a better place as they sing their way through the day's adventures. Produced by Enrico Lopez-Ya�ez, Asst. Director, Nashville Symphony; Jeff Silverman producer of Mattel's Barbie "The Look." Composer: Ruth Weber. 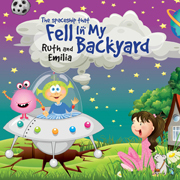 KIDS FIRST!® Adult Jurors say - The Spaceship That Fell In My Backyard is the newest release from mother-daughter team, Ruth and Emilia. Featuring strong engaging vocals and terrific production values this fun-filled musical odyssey will have everyone dancing in the streets... as long as there is no traffic and you've looked both ways four times! URR from the planet Goopda is here on a mission of universal peace (like we need it!) and our heroes share positive adventures of love, acceptance and care for planet Earth. A splendid time is guaranteed for all! This energized pop-rock music has some very fun arrangements and instrumentation. It is well produced. The vocals are well-performed and the musicianship is terrific. There are lots of positive messages about love, acceptance, friendship and caring - all very relate-able child oriented issues. The structure follows a theme about our heroes befriending an alien traveler and they share positive goals for the planet. On the plus side, the alien doesn't eat them! This CD is perfect for its intended audience and is created in a gentle loving way. There are safety tips, caring for the planet advice and words of wisdom about befriending people from foreign lands. It all proves that learning and fun can be one. The artists know their audience and intended age group well. I love the way it celebrates our individuality as people and cultures, our deep love and caring for the Earth and the joy and appreciation of our friends near and galactically far away. This CD, in association with their stage show presents a nice package that will get kids get excited about outer space, Earth stewardship and respect for other cultures. I highly recommend it and give it 4 out of 5 stars. My audience recommendation is ages 5 to 10, as well as parents. Reviewed by John Wood, KIDS FIRST! Adult juror. KIDS FIRST!® Kid Jurors say - This CD has lots of wonderful, catchy songs - all upbeat and inspirational. They tell the story of an alien crashing down in a little girl's backyard. They sing about friendship and having fun in life, brushing your teeth at night, saying no to drugs and not talking to strangers. I love how they make catchy songs about these good habits. The song helps you remember these habits. The only concern I have about this CD is that some of the songs contain words in them that young listeners might not understand. Even though younger children might sing the words, it is always good to include words that young kids understand. Another issue I have is that some of the songs are sun really fast, making it hard to hear the words they are singing. The CD is definitely informational and catchy and something that kids will definitely learn something from. I recommend it for ages 3 to 7 and give it 4 out of 5 stars. This CD comes out on March 23, 2018 so be sure to check it out! 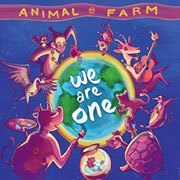 This CD tells a story through song and a blend of a variety of music types. Although it teaches positive lessons, this CD is a promising concept met by a somewhat disappointing result. The storyline is about a young girl named Emilia whose backyard is the landing site for an alien ship from the planet Goopda. The spaceship is carrying an alien named URR. Emilia and URR learn about each others' lives and find they have more in common than they thought. The CD struggles at keeping an overarching idea to justify an entire CD. It starts off with the thread about Emilia and her otherworldly visitors and then descends into a group of songs about world peace and bubble baths. It doesn't reclaim its original thread until much later and abruptly ends just when it starts to get interesting. I recommend it for ages 3 to 7 and give it 2 out of 5 stars. Younger kids will enjoy the happy vibe and simple rhymes. Description - This is a musical treasure trove that joyfully celebrates the common chord of the human family. From Celtic to Cajun, African to Mexican, Caribbean to American blues as well as jazz and that Bo Diddly beat, "Life Circles" takes the listener on a spirited musical journey! 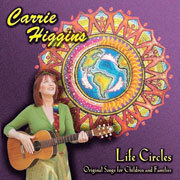 KIDS FIRST!® Adult Jurors say - Like her song Sweet Potato Pie, Carrie Higgins' 'Life Circles' album is chock full of terrific musical ingredients that will bring a satisfied smile to your face and will keep you coming back for more. Her vocals and songwriting skills are terrific and her choice of subject matter skews well for her target audience. With the extra added baked-in pinch of love throughout, this CD is quite perfect for home, school and travel time! There are a lot of positive values, catchy tunes and variety in subject matter. The songs are well-produced and performed including stimulating musical styles and effects. It is very supportive with clear participatory call and response and overall gentleness and love. There are positive behaviors modeled: connection with the Earth, love for all people, appreciation of our differences and love of family. She never talks down to the children and keeps concepts understandable to her target audience. It is very well recorded. Carrie Higgins' voice is terrific! Well-played all around. It offers a plethora of pro social benefits from the importance of love and family, the boomerang effects from lying, the importance of healthy food and the idea that dreams and aspirations can be attained. I would hope that this album would be subject to repeated listening and instill a stronger sense of belonging and self-esteem in the children. I give this 5 out of 5 stars and recommend it for ages 3 to 8. Reviewed by John Wood, KIDS FIRST! Juror. KIDS FIRST!® Kid Jurors say - Life Circles is a positive album with good background instruments and a unique set of songs. Singer / songwriter Carrie Higgins's album is geared towards families and features songs about everything from blood sugar, to an interesting connection with a robe, to a folk tale in song form. My favorite song is Rock-A-Bye. It's got a good rhythm and I appreciate that the repetition goes on just long enough to make it catchy without being annoying. I also like that the songs draw from a range of influences and styles from around the world, including Latin and African beats. My one criticism of this album is that there is no major shift in tone in the selection of songs. While these upbeat high-tempo tunes have a nice assortment of instruments, few songs stand out from the others. Life Circles is a perfect CD for a road trip. It has 14 songs that will have you and your kids singing along. I also like that they use children's voices for some songs. Kids are more likely to enjoy it when they know that their peers contributed to the album. Overall, the songs are cheerful and easy to listen to. Younger kids and their families are sure to enjoy this fun CD. I recommend it for ages 3 to 9. HOLIDAY AND EVERYDAY SONGS - HAP-PAL MUSIC, INC. Description - This is a collection of songs about holidays throughout the year combined with songs about special things that happen every day. Included songs for Martin Luther King Day, Valentines Day, Chinese New Year, Halloween, Fourth of July, Cinco de Mayo, Christmas and more. KIDS FIRST!® Adult Jurors say - At last count Hap Palmer has written over a million songs - most people will be too lazy to fact check that fact. It's an election year. I elect Mr. Palmer to the Kids Music Hall of Fame alongside Mister Rogers another bastion of children's rights even when they're wrong sometime and need a hug and a cup of musical cocoa. 'Holiday and Everyday Songs' is a 19-song extravaganza of musical styles and feel good candy kisses that will have mom and dad dancing in Neolithic ways and kids downright digging the tunes and sharing and learning different cultural celebrations and appreciations. This album is memorable! Reviewed by John Wood, KIDS FIRST! Music Judge. 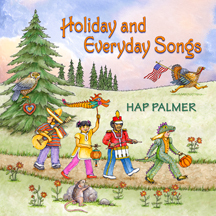 KIDS FIRST!® Kid Jurors say - Hap Palmer Holiday and Everyday Songs is fun to listen to. We like the music and the singing. The singing is not like other songs. The songs have expression and feelings. We especially like the song Witches' Brew. The words are so fun and it's catchy. That song gets stuck in your head all day. We love it! It's our favorite. We also like the song Scamper a lot. We think other kids would like this CD because it's really fun! Description - This new album, exclusive to Amazon, presents 35 familiar nursery rhymes and songs, collected from hundreds of possibilities in the children's canon. These fresh and sparely produced tracks provide the perfect opportunity for parents to remember their own childhoods, and to connect with their kids through melody, rhythm and rhyme. 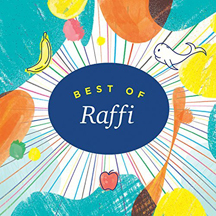 Acclaimed children's book and magazine illustrator Ekaterina Truhan created the sprightly animal parade art for the album, which also features a "selfie" image of Lisa Loeb on the front cover, and noted singer Renee Stahl guests. KIDS FIRST!® Adult Jurors say - Nursery rhymes have been around for hundreds of years and many of the characters are based on real historical figures. Babies don't really care about that but they love the repetitive lyrics and easy to sing melodies especially when loved ones are bonding with them. 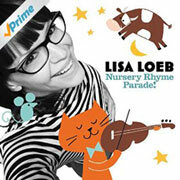 Lisa Loeb has assembled the definitive collection of 36 familiar nursery rhymes with simple yet sturdy production that accents her lovely distinctive voice, delivers a compelling album that will favor many repeated listenings and join the lexicon of evergreen children's music. These songs will stick and be passed on to future generations just as we learned them. The performances are first rate across the board. Some language is antiquated but it doesn't matter. The fun is the repetition. i.e.. Row, Row Row Your Boat. The songs are intended for the target age group and their parents who share them. The quality is consistently good. There is a simple structure of voices, percussion and guitar. Reviewed by John Wood, KIDS FIRST! Music Juror. KIDS FIRST!® Kid Jurors say - We liked this CD. It was fun. We liked the music. Our favorite songs were Humpty Dumpty Sat on a Wall, Farmer in the Dell, and Hush Little Baby. We acted out the songs while we listened. We played with each other while we were acting out the songs. We knew some of the songs already. We have a giant book of all the rhymes that Mother Goose made. It was fun acting out the rhymes. We liked the singing. We want to listen to it again another time. Reviewed by KIDS FIRST! preschool jurors. Description - These full-production songs are both highly entertaining and age appropriate--adult quality music with words and themes that tap into the most common issues confronting 4- to 8-year-olds. These songs were written and produced by award-winning child psychologist, Dr. Mac, who has also been the music director and songwriter for the PBS hit, Jay Jay the Jet Plane. The songs come with a workbook with 125 pages of reproducible lyrics, coloring pages and activities for each of the songs. Collections reviewed include: Friends & Sharing; Social Skills & Bullying; Manners & Character; Happiness & Attitude. KIDS FIRST!® Adult Jurors say - To date Happy Kids has released 8, five song, theme-based CDs that are highly produced and performed and share an abundance of sweet, life-affirming lessons wrapped in audio candy for the ears. 'Social Skills & Bullying', for instance, features songs that present tools to deal with bullies and messages on sharing and celebrating differences. The producers and writers know their young audience well and are fully aware of the pressures and concerns that confront them from within and without. Terrific tools for the classroom and anywhere kids are present! Across the board, the performances - both child and adult - are first rate. The arrangements are terrific and the recording quality is highly professional. LET'S BOOGIE - RAINBOW SONGS INC. Description - The debut album from Toronto children's' rock band, Rock'n'Rainbow, this CD is a family dance party of high energy tunes with catchy hooks & funk-rock rhythms, exploring favorite forms of exercise: biking, heading out on scooters & boogying-on-down. KIDS FIRST!® Adult Jurors say - 'Let's Boogie' lives up to its name and gets you up moving from the first downbeat. I recognize the musical influences and hip performances but the album never talks down to its intended young audience and in places lifts them up to higher ground. Sharp clean production value and solid vocal and songwriting skills will most certainly lead to repeated listening. A nice mixture of participation and a nod to classic children's songs make this album a certain choice for a road trip.. KIDS FIRST!® Kid Jurors say - Rock 'n' Rainbow is a super fun band to listen to. Their CD Let's Boogie is full of fun songs. This is definitely not music that is played on the radio. I believe this is so much better. Their is no foul language on any of the songs. The songs on here are very catchy. My favorite song is "The Freeze". 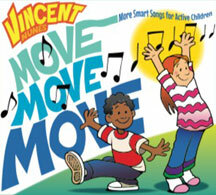 Some of the songs are learning songs like "Hands Together, Hands Apart" and the rest are cool songs to get you moving. This is a CD that can be played at birthday parties or possibly while kids are cleaning up their rooms (I have and it makes cleaning faster). Inside the CD cover, there is a booklet with all the songs and their lyrics. If you get a chance, check out the videos, they are just as fun as the CD. 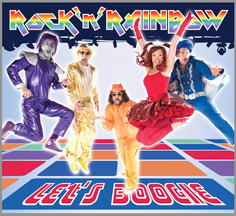 I recommend Rock 'n' Rainbow's Let's Boogie CD for ages 3 to 9. Reviewed by Kamren W., age 9, KIDS FIRST! Film Critic. Description - Original fantasy musical/rock opera for tweens, teens, combining colorful characters, compelling story, infectious songs, danceable duets, narration, full musical score. Percy Jackson meets Into The Woods. Enchanted books, witches break into song!. KIDS FIRST!® Adult Jurors say - 'Aoede - Do you Believe in Magic?' is a fanciful adventure - down the rabbit hole - of magical musical riveting storytelling and exciting labyrinths of trust and misdeed. The nicely constructed songs propel the story with solid performances and strong arrangements. Do you believe in magic is a rhetorical question but you just might believe after listening. The music is true to its story and well produced. The story moves along fluidly and the structure and continuity are true to its genre (fantasy). The content is stimulating and attractive. It is in touch with its audience (tweens) and leads and guides them along the way. The performances and production values are terrific. KIDS FIRST!® Kid Jurors say - Do you like stories about magical creatures? Spells? Well, this musical is for you. 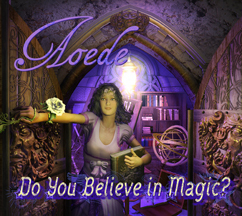 Lisa Sniderman's Aoede Do You Believe in Magic? CD is a kids musical full of goblins, witches, spells, and the most important, singing. Aoede and her friends are trying to save Wonderhaven from witches. This CD does a good job of mixing a narrator telling the story and many other actors to act it out. While listening to Do You Believe in Magic, you will feel like you are right there watching the musical live. There are three acts for this play. Each act is easy to follow. I do recommend listening to Act 2 carefully. There is a lot of action in this act and it will help bring the story together for Act 3. I do wish it came with some sort of booklet or picture book to look at. This CD gets 4 out of 5 stars. I recommend this magical musical CD for ages 7-12. It may be a little creepy for younger kids to listen to. Go pick a copy of this magical journey up today. Reviewed by Kamren W. KIDS FIRST! Film Critic, age 9. KIDS FIRST!® Adult Jurors say - 'Hot Air' rises to the occasion and delivers a potent punch of fun, danceable and delightfully listenable tunes that will lift your spirits and take you on flights of fancy that are frown resistant. Recess Monkey is a tried and true band of experienced and educated musicians who have inhaled the wonderful songwriting and production values of top groups from the late 60's and 70's and have exhaled a new, original and pleasing paradigm of songs that are kid-friendly but more importantly, kid-conscious. Up up and away, the sky is the limit, or is it? 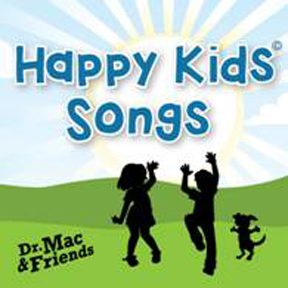 KIDS FIRST!® Kid Jurors say - My kids, ages 4 and 6, had a lot of fun listening to this CD. The songs were very upbeat, and they were dancing around to the music. They said there were a lot of words that they didn't understand, but they really liked the songs. Then they heard "Oh Lando." They are Star Wars nuts, and this song was so exciting to them. Even though they couldn't understand everything, they definitely got that it was about Star Wars, and that was, by far, their favorite song. Other favorites were "Lighter Than Air" and "Penguinese." I even heard one of my boys singing the songs later on in the day. The songs are catchy and fun, and my kids loved listening to them. They said, "We loved that there was a song about Star Wars," and "We liked dancing around to the music." Description - Fifteen beloved folk and classic children's tunes capture the heart of the songs. Authentic instrumentation, thoughtful arrangements, restored lyrics, and Andy Z's friendly vocals complete this rousing CD that will entertain and engage for years. KIDS FIRST!® Adult Jurors say - From 'This Land is Your Land' to 'Happy Trails,' Andy Z brings a freshness and excitement to familiar songs that we think we may know but after a few extra verses that were part of the original songs and some well-played musical surprises our ears are buzzing with a renewed acquaintance with old friends. The vocals are engaging and the toe-tapping arrangements will have you dancing with a 'Turkey in the Straw' or breaking out a 'Hokey Pokey' or singing along with 'You Are My Sunshine'. 'Oh Susanna' you've got to listen to this CD and don't you cry for me now, girl! The songs are performed as close to their original intent with all of the original lyrics and instrumentation approximated. This absolutely keeps the tradition of American folk songs alive and well. It is positive and uplifting and the interpretation of songs that a lot of us have heard for years is fresh and engaging. The quality is excellent. The music mirror the birth of our nation which was an exciting time for America in terms of exploration and strong families along with adventurous and brave people immigrating from all over the world. These songs offer insight into American history from a musical point of view. The artist starts with the premise "maybe you're familiar with this song, but did you know there are other verses?" Particularly enlightening is "Take Me Out to the Ball Game" with the wraparound lyrics. The musicianship, choice of traditional instruments and vocal performances are well-done and engaging. The production value (recording) is very professional. KIDS FIRST!® Kid Jurors say - The kids enjoyed listening to this CD. They clapped and moved along. Overall, they seemed to have fun. All around the Kitchen and You are My Sunshine were two of their favorites. The songs are upbeat and energetic and it was nice to see the kids enjoying some of the old classics, some of which they apparently had never heard before. The performance is entertaining and the songs are fun. One little boy said his favorite was the first one. Another child was excited about the kitchen song. An older boy said he liked the middle songs best. One girl liked the sunshine song best. "It is good music." "We like all the music." "It is singing." Description - Twelve cheeky, laugh-out-loud funny songs. Combining country and children's pop music with a wacky, seesaw feel, moving from a country stroll where the wit sneaks up on you to a rock 'n' roll sprint where an outrageous lyric slams into you. 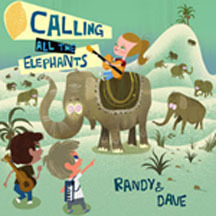 KIDS FIRST!® Adult Jurors say - Put on the headsets and buckle up because 'Calling All the Elephants' is one of the best albums in a long while to make you laugh out loud and snort milk out of your nose! The word-play, songwriting and musicianship are exemplary. Randy Sharp and Dave Kinnoin, two-seasoned performers, flex their musical chops and in the process push the creative boundaries of children's music in a profoundly wondrous way. These crafty clutch of tunes hatch from basic concepts and happenings into mini-operas of mirth and merriment. Be yourself. Be resourceful. Be different. Be inventive. Be creative. Have FUN! Who could ask for anything more. Love this album! Lyrics are stellar, brilliant and quite appealing. The music and production are terrific. Plus, there are many wonderful surprises. Very clever! Everything clicks like an expensive watch. It's rare to discover an album that appeals to older children, doesn't talk down and takes conceptional chances. This is a breath of musical fresh air. In ways, it is purposely disrespectful of what is considered appropriate in children's music. Therefore, kids will love it! I love an album that invites frequent listening because you flat-out love it and / or continue to discover new elements and surprises that you missed before. This is one of those albums. Never gets old. Solid vocals and character voices, musicianship rocks and the recording quality is state-of-the-art. KIDS FIRST!® Kid Jurors say - This is fun and original and many of the songs have a really good beat and rhythm to them. I like that this CD has songs with funny lyrics. My favorite songs are Last Word and Puzzle. I like how the lyrics in Last Word throw in words such as "foot" and then there is a pause and "ball" is added or "cow" and then "boy." Puzzle is just catchy and is fun to dance to it. Most of the songs are pretty cool and make you want to dance. Some of the lyrics are repetitive but I still think they are pretty good. There is only one song I really didn't like as much and that is Acting Like A Baby. I think it is just the topic that I don't really enjoy. The song is still catchy. But, how often do you really like every song on a CD? Over all, this is a CD with fun songs, catchy lyrics and I give it a thumbs up. Best for kids ages 5 to 10. Some older children may not like it as much. I would give this one 4 out of 5 stars. DANCIN' IN THE KITCHEN - COMMUNITY MUSIC, INC. Description - Grammy Award-winning musical duo Cathy Fink and Marcy Marxer celebrate 21st century families with this new album of songs and stories. The 15 tracks reflect the diversity of families in the US today, and highlight the idea that families are bound by love. Guest stars include Riders in the Sky, the Savoy Family Cajun Band, The Canote Twins and Kim & Reggie Harris. At the request of Nora Guthrie, Cathy Fink set Woody Guthrie's poem "Howdy Little Newlycome" to music, enlisting Irish super group Cherish the Ladies to perform. The title song reflects the fact that the kitchen is the center of many homes. 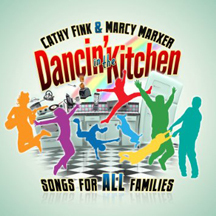 KIDS FIRST!® Adult Jurors say - Dancin' in the Kitchen by Cathy Fink and Marcy Marxer knocked my socks off so I immediately decided to dance barefoot in the kitchen - great decision. This album is a breath of fresh air that climbs the mountain of rarefied musical integrity and promotes acceptance and tolerance on so many levels. First and foremost, I doff my symbolic cap to a duo that I have admired for so many years for their ultimate musicianship and steadfastness to true North. When you wrangle high-class talent, incorporate brilliant songs and deliver unswerving production values the gestation of your endeavor has value for the ages. Could I break down every song for you? Yes. Could you listen to samples somewhere? Yes. Is my review a teaser? Yes. Are samples a teaser? Yes. Get on up, people! You will not be disappointed or dismayed, this album is special and grabs you from the first downbeat to the last fade-away. XOXO. This is an exciting and vibrant CD from the first downbeat to the final fade. There is a lot of wonderful music and supporting messages regarding the diversity of families and their makeup. Cathy and Marcy know how to producer, perform, pace and structure an album. This CD has many guest groups and a wide range of songs that flow seamlessly. Though topics of divorce, adoption and same gender parents are presented through song, it is never heavy-handed but presented with love and joy. Better learn how to get your dance on! Sit back and enjoy funny word play and stories and a wonderful array of musical sounds. These 15 performances are absolutely top rate. Vocals are spot on and engaging and the musicianship is stellar. The production value is impeccable. Review by John Wood. KIDS FIRST!® Kid Jurors say - This CD by Cathy Fink & Marcy Marxer is sweet and loving. The title song Dancin' in the Kitchen is very upbeat in a zydeco style. My two birds loved this song. They moved their heads to the beat. It was so funny! My favorite song is Everything Possible. It's very calming and has a sweet message that you can be anything. The two songs Dinnertime Orchestra and Who's in Charge of Naming the Colors are both stories. In I'm my own Grampa, I enjoyed the tune but found the words very strange. Also From Scratch is a sweet lullaby. Most of the songs have amazing lessons to learn about accepting our differences, such as if your family is different or your skin color is different than your friends. I belong to a Family is also very sweet. I recommend this for kids age 2 to 8. I can see a lot younger kids dancing to it. I give this CD four out of five stars because it is fun and a good CD for little kids. This CD is a good form of entertainment to bring children of this age together. The kids in our group had a good time listening and dancing to the music. Though they are young and distracted, the music brought them right back to dance together. The stories told in the music are simple and their responses to all ones of enjoyment, smiles abound. The children loved the music and had a good time. The music is about families and togetherness and they could relate to that. The dinnertime orchestra was particularly fun and kids responded to it enthusiastically. They listened intently and danced along. They were too young to sit and listen to the entire thing all at once but wandered off and returned frequently. The pace of the music is perfect, fast enough to be engaging but not frenetic. Description - From Disney to the Beatles, Standards to Billy Joel, this album of cool, acoustic arrangements will successfully soothe little ones to sleep while adult listeners relax to the satisfying, fresh take on 'kids' music. KIDS FIRST!® Adult Jurors say - "Shine" is well-produced, well-performed and is well aware of its intended audience of sleepy little ones. Thirteen songs are represented from some of the world's beloved songwriters and one lovely original soon to be a classic. Suzanne Jamieson Selmo's vocals are clear and soothing and are supported by terrific arrangements. There is a consistent flow to the album despite divergent songs from a myriad of sources and intent- kudos to the production team! The subtitle to the album is 'Lullabies for Everyone' and that is true because I fell asleep three times while listening... and that's a good thing! The album flows well helped by good arrangement and smooth and soothing vocals. It is perfect for sleepy time and parents will enjoy it as well. Should stand up to many repeats. The album was obviously designed for young audiences; the content follows suit even though it comes from 14 different writers. The behaviors of love and caring shine through the songs and the presentation. Some of the language may be beyond little ones but that allows adults to appreciate the songs as well. The vocals are consistently solid as well as the arrangements and players. The recording quality is top-notch. I think this is a favorite album that a child can grow with and learn to appreciate all the fine songwriters represented herein. They may want to know about other songs by them. Reviewed by KIDS FIRST! Music Juror John Wood. KIDS FIRST!® Kid Jurors say - The music is very soothing and can be used for bedtime. It worked well as background music for them, not demanding their full attention. Description - The first interactive lighted cover art. Two CD set of 30 tunes for anyone who wants beautiful music to drift to sleep and optimistic music to awaken. A calming yet intellectually stimulating experience for children, with world class musicians and Nashville Symphony's live string orchestra. KIDS FIRST!® Adult Jurors say - Nightlight Daylight is an exceptional package from first look and apparently you can tell a book, uh, CD by its cover. Its lovely, interactive fiber optic cover is off the charts - push the moon and the stars and fireflies light up. Impressive! It just gets better. After I finished pushing the moon for about half an hour I delved into the treasures within: an ambitious 30-song two-CD set. Hence the title. The artist, Muriel Anderson, is a force of nature and a brilliant guitarist. The first CD, Nightlight, is perfect for winding down and drifting into dreamland with soft and soothing guitars and vocals with support from some major talent. The Daylight CD, although equally talented, is more suited for an adult audience. The music is absolutely stunning and so well played. Primarily acoustic guitar supported occasionally with other unobtrusive instruments. Half the album (lullaby) is directed to children while the second disc is more suitable for adults which is not necessarily a bad thing. I recommend this to anyone - there is so much to like - great for lullabies and meditation. Very soothing. 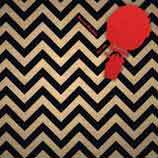 This double album flows along seamlessly from night to day. The classical-based guitar work is exemplary. However this is not totally a children's album. The quality is amazing across the board. It will retain a youth audience on the first CD but not on the second. I cannot express how much the performances and production quality resonates. I look forward to Muriel Anderson's next release! Reviewed by John Wood. 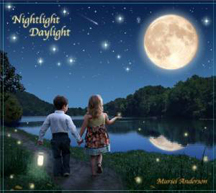 KIDS FIRST!® Kid Jurors say - I liked this CD set because it has both day and night songs. It has really cool bonus features too like light up stars on the cover and removable guitar pics. The Nightlight CD is my favorite because it would be good to listen to at night if you can't fall asleep. I liked the Daylight CD too but would have liked faster melodies and more lyrics. I would recommend this for ages 2 to 7 because older kids may get bored. There are few lyrics. It is mostly instrumental. The packaging is really cool. When you push down on the cover, the stars light up.